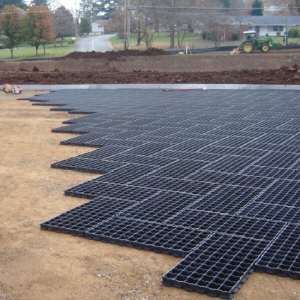 Presto Geosystems Porous Pavements | GeoCHEM Inc.
Our porous pavement solutions can be designed for use with a variety of permeable fill to suit any loading and stormwater requirements. Three high-performance paving options offer porous solutions to hard surface pavements: GEOBLOCK® grass pavers; GEOPAVE® aggregate pavers; and GEOWEB® pervious soil stabilization systems — all economical options for emergency, utility and site access roads, and permeable parking areas. Each solution is suitable for low impact development (LID) and green infrastructure design and contribute to green building credits for managing stormwater and reducing site disturbance. GeoCHEM provides three porous pavement product lines depending on your specific needs: GeoBlock Vegetative Porous Paver and GeoPave® Aggregate Infilll porous pavement systems. The GeoBlock® Porous Paver System is a series of interlocking, polyethylene paving units designed to provide superior load support and turf protection for emergency and utility access lanes, auxiliary parking, golf cart pathways, trails, and other high-use application areas. The GeoPave® Porous Paver System with aggregate or an aggregate / topsoil engineered infill, provides a permeable, stabilized surface for vehicular and pedestrian load support. The Geoweb Geocell Confinement System with aggregate / topsoil / engineered infill for porous load support applications.